You can listen to my interview on Don Fanelli’s fantastic Need To Fail podcast. I discuss some of the ups and downs of my career and the process of auditioning for and coming close to my dream job…and not getting it. Enjoy! You can listen to my interview on Don Fanelli’s fantastic Need To Fail podcast.! 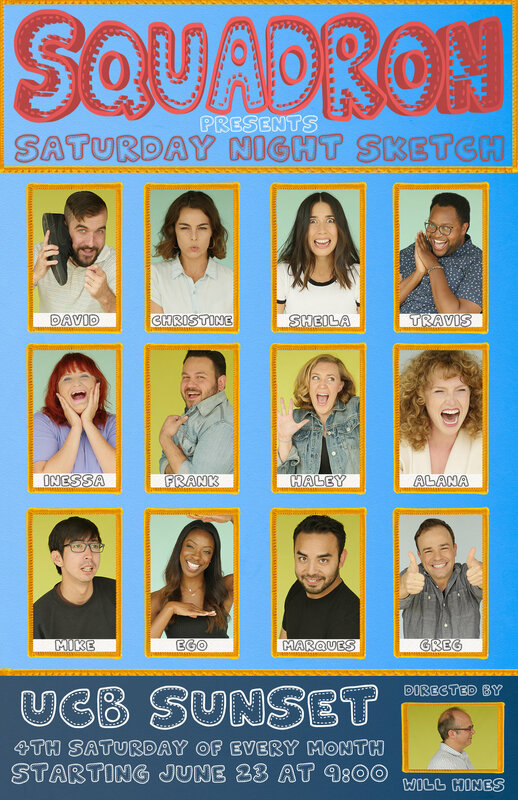 Catch me performing with the new powerhouse sketch group SQUADRON every 4th Saturday of the month at UCB Sunset! Check me out on USA's First Impressions with Dana Carvey! I am excited to announce I will be joining the new Broadway Video offshoot: Más Mejor! I perform every Friday Night at 7:30pm at Upright Citizens Brigade Theatre NY East Village: BUCKY: Thank F#@% It's Friday! Click Here to purchase tickets. I am co-direct the UCBT character house team Characters Welcome. We're up every 3rd Monday of the month at Upright Citizens Brigade Theatre NY East Village. For tickets click here.